For a long time we’ve warned players not to put their boules in their carry-on luggage when they fly. Transportation Security Administration (TSA) officers consider boules to be dangerous objects (like hammers) and will not allow them to be carried onto a plane in carry-on luggage. The other issue is that, to a TSA officer who has never heard of petanque, a boule looks like nothing so much as the stereotypical image of an anarchist bomb. 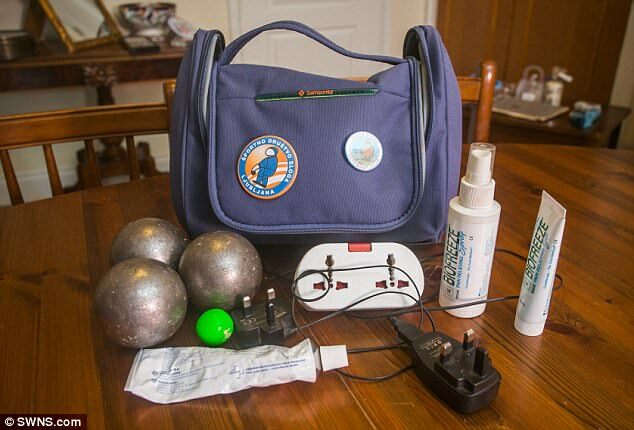 That was emphasized today when a 63-year-old petanque player from Jersy (in the UK) attempted to fly to a competition in Denmark with his boules bag. The bag contained, along with his team uniform and his set of personalized boules, a phone changer and its cord, some kind of white electronic device (perhaps a voltage converter to go along with the cell-phone charger), and (something that older and arthritic players will immediately recognize and sympathize with) three containers of Biofreeze. The Jersey TSA officers thought that the assemblage looked like a collection of bomb-making parts. They seized the bag. Since the player was an experienced veteran, I think that the bag must have been in his checked (not carry-on) luggage, but the bag was seized anyway. The player had to fly on to the competition without his bag. He played in a borrowed uniform, with borrowed boules, but didn’t play up to his usual level. His bag finally caught up with him, but too late for it to make a difference. Apparently most players at the competition found the story amusing, but there is a serious lesson here. The TSA is (rightly) paranoid about containers that contain any kind of liquid. Electrical timers and wires are stereotypical parts of a bomb. (“Should I cut the red wire or the blue? !”) TSA officers must process a lot of bags quickly— they don’t have time to stop and carefully analyze something that on quick inspection looks like it might be suspicious. So they just act. (b) in the same bag, don’t put anything that contains liquid, looks even vaguely “electronic”, or has wires. This entry was posted in Pétanque by Jules Lenoir. Bookmark the permalink. I have carried my boules on domestic flights for years. Never a problem. We have flown around the world twice (2016 and 2018) with boules in our carry on luggage including through the US and not had any problems. We have had interesting discussions with the xray machine personnel but never any any issues. Wearing a petanque uniform helps. We have had to hand over our 10cm nails which we use as markers. Conversely, flying from Queenstown airport, New Zealand, to Wellington, we were required to go to the checked baggage handling area where our checked luggage had been xrayed. My wife had her boules in her suitcase and we were asked to open the suitcase so the the 3 dark objects could be examined. No problems though.